BMMA held a consultation with lawyers and religious experts in Chennai on 30th and 31st March 2013 to discuss the draft law. Mr. Faizur Rahman, Adv. Zafarullah Khan, Adv. Jawad, and Mr. Salim participated in the consultation. Many suggestions were given and they were incorporated in the draft. Ms. Noorjehan Safia Niaz, who has been working on the draft since 2007 presented the draft and called for suggestions and comments. A similar consultation was held in Puri, Odisha to discuss the draft with members of the Sauhard Manch who came from Odisha, West Bengal, Gujrat, Madhya Pradesh, Andhra Pradesh. Again many suggestions were given by the participants. 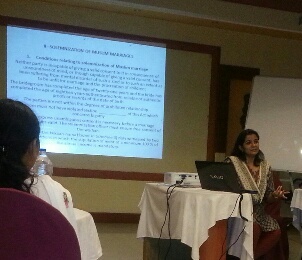 Zakia Soman gave an overview of the development of Muslim Family law in India and Noorjehan Safia Niaz presented the draft and called for suggestions.